Welcome to the QA Revolution! What is the QA Revolution? So you are probably curious about the name of this website and want to learn more about it. I have been building this website for many years. My passion is software testing and I really enjoy learning as software testing is changing every year. I enjoy sharing my knowledge and passion with other people. I am hoping this website will be helpful for you and that you will learn something when you stop for a visit. Many years ago, while I was completing my MBA, I began to learn the importance of marketing and how it could help transform the current testing organization that I was leading. I met with the team and discussed the idea and wanted to learn more about why we were struggling and what we needed to do to become a critical pillar within the IT organization. We talked about some of the mistakes we had made in missing some defects, but I also encouraged them that we needed to build a brand and market it outside our team. Everybody embraced it, and we came up with a team name and called ourselves The QA Revolution. I wanted the team to be able to hold their heads up high and be proud of the work that they had done. We built a quality brand and literally started QA Revolution! We created posters, created a logo, had signature lines for our email and developed websites that would help to build our brand. This was a tremendous hit, and because of that, suddenly being on the QA team was cool, and others wanted to come join the team. And believe it or not, they did. I am talking developers and engineers..the cool kids wanted to join the cooler organization. I tell the story in order to build a point, that building a brand is important. It helps to define who you are and where you are going. It establishes a vision with a mission. These days people are looking for something to believe in that they can fully embrace. Those memories will live on forever, and I am looking forward to be able to reproduce that again and again. The Agile methodology has turned traditional software testing organizations on its head. We have real world experience transforming multiple industries and successfully implementing best agile testing practices. Agile done well can have a tremendous impact. The agile product methodology is the one that I have successfully used at one of my most recent positions. It is important to leverage best practices when using agile. Developing software in short agile sprints with high quality production delivery can put your organization far ahead of your competition. There are many learning opportunities in reaching agile nirvana. It is a process and more of a marathon than a sprint. Some challenges I have learned along the way is there are agile mistakes along the way. It is fine to make mistakes since no organization is perfect. The important thing is to learn from your mistakes. From a testing perspective, things like end to end testing are often forgotten because they take too long. The result of that is poor quality, which is something that your business organization cannot afford. DevOps has blurred the lines between development and testing. It has accelerated the pace of automated code deployments and given opportunities to integrate automated testing into the process. DevOps is simply the processes of collaboration between development and the operations team. While the goal is to make processes more efficient automating everything may not be the best answer. It has to be determined within each organization. The ultimate goal is to help your business win. If you have built a killer DevOps team, but don’t set your business up for success, you will have missed the goal entirely. I believe the DevOps practices are here to stay, but I have used these same techniques for many years before the word was invented. DevOps enables testers to spend more time testing and less time waiting for test environments to be setup. 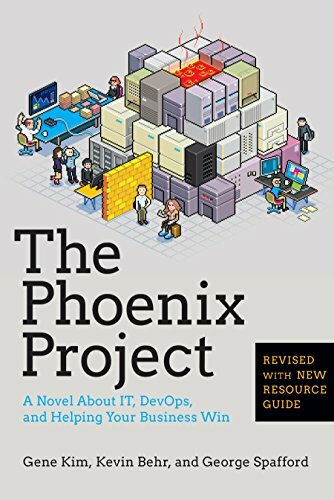 If you are looking for more information on DevOps, I have published an article that highly recommends reading The Phoenix Project and The DevOps Handbook which are both written by the DevOps Rockstar Gene Kim. I don’t like to read but I really enjoyed these two books. It is critical in invest time in learning DevOps. There are DevOps challenges that will happen as you standup the organization, so you need to be realistic and allocate enough time and resources to do it properly. Once you reach a steady state, then you can focus on continuous process improvements which will really get you to the next level and provide some significant DevOps benefits. DevOps is really very complementary enabling software testing transformation. Test Automation has gone mainstream and all software testing organizations must do it to keep up with business demand. It requires extreme technical expertise and multiple toolsets are needed. Test automation is my passion and I have built multiple organizations and driven automation up to 95% automated. I believe all software testing organizations need a strong test automation practice. I have used both Selenium and Unified Functional Test to help deliver strong value in automating pretty much everything from mainframe to mid-range to web front ends. There needs to be a strong focus on automating what makes sense, and what will provide a good return on your investment, since it can be very expensive to maintain. Creation of an effective test automation framework is critical so that it can handle most of the workload. The beauty of an automation framework is that you can leverage it, instead of building thousands of scripts that will have to be individually coded. Over the years, software testing has evolved. It has grown from some fantastic software testers to quality engineers. Manual testing has evolved for sure over the last 20 years into something that is more sophisticated. Sure, there will be manual testing forever, because everything does not need to be automated, but the days of having only manual testers are long gone. In order to keep up with the demand, you have to have highly skilled individuals with development type skills. Notice I said development type skills, not developers, because I firmly believe that a great developer may not transform into a great tester. The key is a mindset. Are you curious? Do you ask a lot of questions? Are you analytical? Do you like numbers? Can you see typos and other errors better than anyone else? Will you ask the difficult questions and challenge the status quo? These are some of the questions I ask when I talk to potential candidates. While having a stacked resume with skills, education, and certifications are truly impressive, they will not answer the questions above. A quality engineer needs to be able to seek, probe and find those edge cases where nobody else dares to venture. Quality Engineering has somewhat merged with DevOps, so those lines are starting to cross. Those that can think, code, and solve complex problems are the quality engineers who will have long careers in this field. Are you one of those? Are you looking to build your career into a quality engineering expert? I have built many years of knowledge on The QA Revolution website. I encourage you to look around and learn more. I am constantly adding new content that is relevant to the rapidly changing technology landscape that we currently live in. If you are a software tester, I need your help. What software testing tools does your organization currently use? I received a significant number of replies and based upon that information I have gathered some very interesting information. I compiled 230 responses and identified the most popular testing tools. As you can see Selenium received the largest number of votes by a wide margin. For most people in the software testing industry, this is not a huge surprise. With open source testing tools making significant strides in the last few years and companies looking to save expenses by going open source, it is expected that a testing tool such as Selenium would be widely used. The big takeaway for testers: Learn Selenium. In order to effectively use Selenium, you are going to need to learn how to learn Java programming. If I would have asked this question 5 years ago, HP QC and QTP would have been at the top of the list. I doubt ALM/UFT will be able to get much higher in terms of utilization, but it will be interesting to see if Micro Focus, who recently purchased these tools from HP, will be able to turn things around. The tool stack is well integrated between ALM/UFT/LoadRunner but that isn’t enough anymore. In my opinion the leading factor is cost. Testing organizations simply don’t have the budgets anymore to pay large sums of money for licensing costs. The second factor is these tools failed to keep up with the changes in technology and let smaller and leaner organizations beat them in developing better testing tools. 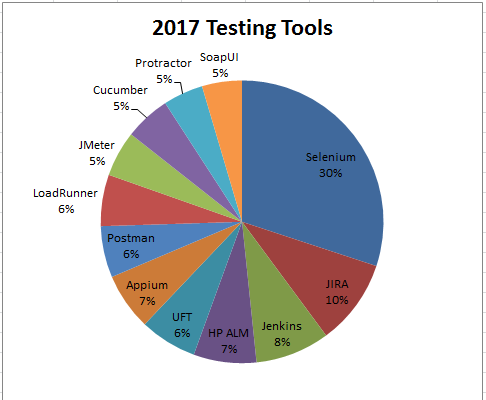 It is interesting to see that web service testing tools such as Postman and SoapUI are slowly creeping up to the top. I believe more and more testing organizations are moving up closer to unit testing and beginning to hit more web service testing and this is an area where testing organizations have tremendous opportunities to find defects earlier in the cycle. I am not surprised by the relatively low numbers of performance testing tools currently being used by testing organizations, but I would strongly recommend companies begin to take this seriously. When performance testing is not adequately done, it is only a matter of time before catastrophic issues occur. Have testers forgotten about Healthcare.gov? I asked a fairly broad question on LinkedIn. It was by design. I primarily wanted to understand what software testing tools were being used, but I also wanted to get a better idea of what tools testers use outside of testing tools. If you take a look at the chart above, JIRA and Jenkins were heavily used tools. Long gone are the days were testers only have to worry about learning testing tools. I hope this information has been helpful. I have been able to gain a better appreciation for the challenges software quality engineers face everyday. I encourage you to take this information and learn a new software testing tool today! The list should help you gain a better understanding of performance engineering. It is important to constantly work on gaining a greater understanding of performance engineering. As technology changes and evolves, if will be necessary to keep up with new trends. In addition, there are some great performance engineering tools that can help complement those tools that you already use. It isn’t for engineering to go both key performance indicator’s and business metrics. This helps managers and testers make better decisions for the organization. Also there is a need to use the key performance indicators and metrics to ensure they are relevant to long-term goals and organizational goals. There is a balance that needs to be closely monitored to ensure too many performance indicators and metrics are not being measured. It will also help the process together these matters can be leveraged using a real-time dashboard. I hope this is helped provide a high-level overview of Quality Engineering KPI’s.